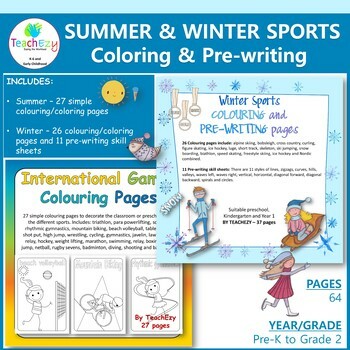 This winter sports coloring and pre-writing resource is great to use during the Winter Olympics or to celebrate winter. The pages are suitable for preschool, kindergarten and Year 1. You will find coloring for each of the winter sports. 37 pages in total – PDF (not editable). 26 Coloring pages: include alpine skiing, bobsleigh, cross country, curling, figure skating, ice hockey, luge, short track, skeleton, ski jumping, snow boarding, biathlon, speed skating, freestyle skiing, ice hockey and Nordic combined. 11 Pre-writing skill sheets: There are 11 styles of lines, zigzags, curves, hills, valleys, waves left, waves right, vertical, horizontal, diagonal forward, diagonal backward, spirals and circles. Note: This resource does not contain the word Olympics due to copyright or the Olympic rings. 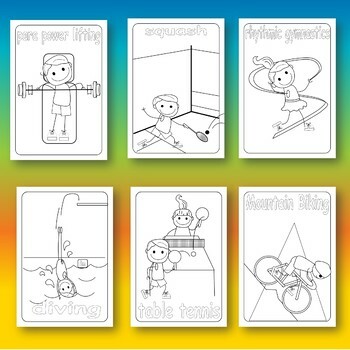 27 simple coloring pages to decorate the classroom or preschool with the different sports. Includes: triathlon, para powerlifting, squash, rhythmic gymnastics, mountain biking, beach volleyball, table tennis, shot put, high jump, wrestling, cycling, gymnastics, javelin, lawn bowls, relay, hockey, weight lifting, marathon, swimming, relay, boxing, long jump, netball, rugby sevens, badminton, diving, shooting and basketball.